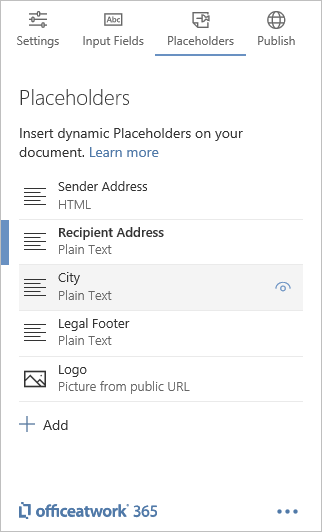 The «Placeholders» page lists all existing placeholders for your active document. «Placeholders» are used to visualize data entered or select via the «Wizard» Add-in, allowing the user to personalize the document purpose fit for his or her needs. To create a new «Placeholder» just click on the «Plus» at the bottom of your lists of «Placeholders». A panel will appear allowing you to provide a custom name and pick one or multiple values for your new «Placeholder». All of these attributes can be changed later. Still we recommend to fill-in all the fields as desired. When you click on the «Plus» icon it will create a native Word «Content Control» as your representation of your «Placeholder» in the document at the current cursor position. Additionally it will display the properties panel for that newly created «Placeholder». Learn more about the individual properties below. To get back to the list of all your «Placeholders» just click on «Done» at the bottom of the «Properties» page. Please note: Any native Word Rich-Text «Content Control» with no «Placeholder Properties» assigned to it, it will be listed as an «Untitled». Please note: Learn more about how to position your placeholder here. To view a «Placeholder» in the document just hover over a «Placeholder» in the list of «Placeholders» and click on the «Eye» icon. This will bring into view and select the appropriate placeholder representation in your Word document. Additionally it will also mark your «Placeholder» in the list of «Placeholders» with a blue bar indicating that this placeholder is currently selected within your Word document. Note that this works independently from pressing the «Eye» icon. You can select any portion of your Word document and the blue bars will appear for all selected «Placeholders» in the list of «Placeholders». To delete a «Placeholder» just navigate to the appropriate «Placeholder» details and use the «delete» button at the bottom left of the page or delete the related native Word «Content Control» in your document and reload the add-in or page to see the list of «Placeholders» update accordingly. Once you have clicked on any of the placeholders you will be taken to the properties page of that placeholder. To return to the list of placeholders just click on the arrow back (1) on the Edit Placeholder page. Use the Name property to give your «Placeholder» a meaningful name. The name will only be used within the «Designer» Add-in and will help you to choose between many «Placeholders» in your «Placeholders» list. This property is optional. If you do not define a name for your «Placeholder» it will be listed as «Untitled» in the Placeholders list. Plain Text: This will transfer all the content from the «Value» field as plain text into the body section of the native Word «Content Control». HTML: This will transfer all the content from the «Value» field as HTML into the body section of the native Word «Content Control». You will be able to use HTML formatting options like for bold or for header formatting. Ooxml: This will transfer all the content from the «Value» field as Ooxml into the body section of the native Word «Content Control». You will be able to use Ooxml formatting options but please make sure that you define a complete Ooxml with all required elements. Picture from Public URL: This will interpret the content from the «Value» field as an URL and insert the linked image into the body section of the native Word «Content Control». Please make sure that the URL points to a CORS enabled server and that the image is publicly available and not protected with any kind of sign-in. The currently supported file formats are: PNG, JPG and GIF. 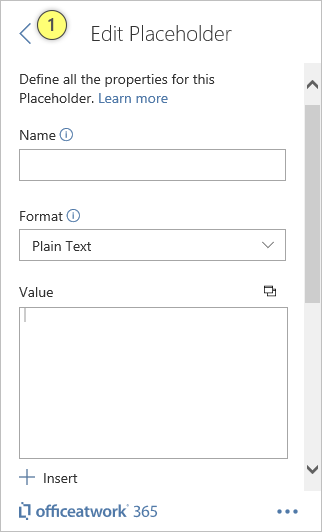 Picture from SharePoint Online URL: This will interpret the content from the «Value» field as an URL and insert the linked image into the body section of the native Word «Content Control». Please make sure that the URL is pointing to your SharePoint online tenant and that the SharePoint online user rights are set in a way that the designated users have access to that image resource (URL) within you tenant. The currently supported file formats are: PNG, JPG and GIF. Please note: Learn more about how to display images in placeholders here. The «Value» represents the actual value that will be inserted in the defined «Format» into the body section of the native Word Content Control in the document. Please note: Learn more about how to customize the value of a placeholder. Use the «Title» property to add a title for your Word Content Control representing your «Placeholder» in the document. This property is optional. Please note: The «Title» of your «Placeholder» will only be visible in the related native Word «Content Control» if the «Show as» property of the «Placeholder» is set to either «Start/End Tag» or «Bounding Box». Use the «Hint» property to define what shall be visible as content of the «Placeholder» in case the «Value» of the «Placeholder» is empty. Use this to hint to the user what values will be visible when data is evaluated as «Content» for the «Placeholder». Note that by default every placeholder comes with a hint pre-defined. So, if you do not set the «Hint» property you will be seeing a hint text whenever your placeholder is empty. To show nothing when your placeholder is empty you need to actively set your hint text to nothing. You can do this by setting your hint «Type» to «Custom Text» and leaving your hint «Custom Text» field empty. Use the «Deletable» property to define if the user shall be able to delete the «Placeholder» in the Document. Set this option to «Cannot be deleted» if you do not want the user to be able to delete this «Placeholder». Use the «Editable» property to define if the user shall be able to click into the «Placeholder» in the Document and change the value of it by typing, pasting or deleting the content. Set this option to «Cannot be edited» if you do not want the user to be able to edit the content of this «Placeholder». Tip: If you cannot format your «Placeholders» on your document it might be set to be non-editable. Please check the «Editable» property of your placeholder to make sure it is not set to «Cannot be edited» when trying to format it. Use the «Show as» property to define the appearance of the «Placeholder» in the Document.